by Anthony (Tony) Marx, Florida Master Naturalist and a Board Member of Friends of Fakahatchee. Visitors seeking to experience the interior of this subtropical wilderness will find that this trail provides an easy hike or bike through a forested wonderland without ever getting their feet wet. If you want to experience a glimpse of S.W. Florida’s primeval past this is it. Stop at the Ranger Station 1/3 mile on the right and pick up a leaflet at the information kiosk and pay a small toll fee. Then turn right on Janes Scenic Drive to continue west, observing the 15 mph speed limit; if nothing else to void the pot holes which increase after the first 2 miles. After a short distance, the paved road ends and continues the width of 1-1/2 vehicles for just over 7 miles when you will see an ample parking lot on your right ending at the #12 gated entrance marked for the East Main Hiking Trail. Over this distance you will have passed through scenic wet prairies interspersed with hardwood tree hammocks, before entering a dense cypress forest containing a large variety of trees, ferns and bromeliads which thrive in the humid sub-tropical climate which exists here. Walk around the side of the gate and you now find yourself on a double track raised trail which was once a tramway (small railway) track built together with over 100 others, to haul out the ancient and stately Bald Cypress trees logged here in the first half of the 20th century. Unlike nearly all of the former tramways which were abandoned and quickly reclaimed by Nature, this trail is kept in reasonable condition because it leads to a privately owned cabin known as Ballard Camp. In most places, the forest grows right up to the edge of the trail. Cypress trees rise tall close up to the trail, host to several varieties of bromeliads which cluster and cling to their branches. The occasional stately Royal Palm towers high above wherever it can establish a firm base, while Cabbage Palms and Carolina Willows provide shade along the way. Pond Apple, Pop Ash, Dahoon Holly, Coco Plum and the occasional Florida Maple add color during season. The dense understory is dominated by Wild Coffee, Marlberry, and dozens of other glossy leafed bushes and small trees, while ferns of many varieties including the Giant Sword fern crowd in successive waves of brilliant green. Look carefully and you may spot a butterfly orchid or an even rarer species. In summer, the water level rises almost to the top of the trail in places, and in winter recedes to the point you may step down to venture a few yards over dry ground into the forest, but be careful not to lose sight of the raised trail as it is easy to get lost. A GPS and compass is a must if you intend going farther. Wildlife is present in its many forms. Alligators may lie basking at the edge of the trail or occasionally snooze right on it. In which case making a noise with a stick or waving your arms will get their attention and they will plunge off into the water. Florida Black Bear may appear and they are quick to flee when they see you. The Florida panther is also a visitor but rarely seen, although captured on video by hidden cameras. Harmless grass snakes may cross the trail quickly, and be observant for the sluggish cottonmouth which, though seldom encountered is present and venomous. Pass it at a respectful distance of at least 3 feet. Herons, and egrets mutter and squawk in the trees, and the occasional red shouldered hawk with its haunting cry swoops along the trail seeking snakes and rodents. A silent and fleeting shadow announces that a barred owl passed overhead and disappeared into the trees, somehow avoiding branches with its uncanny natural guidance system. The rare Everglades Mink dwells here, and otters may provide an unexpected diversion. There is always movement and sound of one kind or another, and photographic opportunities abound. After 1.5 miles the trail opens into a clearing and the rustic cabin known as Ballard Camp appears, one of the privately owned inholdings which still exist in the Park and a relic of the mid-20th Century when it was a logging company supervisor’s quarters. A quaint sign on the wall proclaims it as ‘The Fakahatchee Hilton’. The owners kindly permit you to rest a while on the porch, but be respectful of their privacy especially if their presence is evidenced by a parked vehicle nearby. Behind the cabin is a fishing pier leading to a small lake which can be packed with dozens of alligators in the late dry season March – May. At this point the trail forks. The left fork trail is short and passes a quaint old fashioned outhouse, and peters out a short distance farther on. It ends at an inlet from the lake where some fairly large alligators sometimes bask alongside the water. 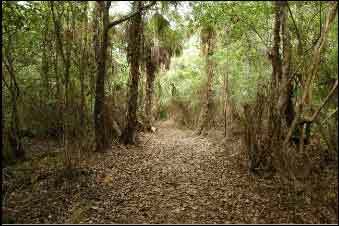 Take the right fork and the trail continues through a forest where cypress, pop ash and pond apple are host to rarer epiphytes such as the powdery Catopsis, which contains a water tank in its center. Unsuspecting insects slide down the slick surface of the leaves into this trap where they become nutrients for the plant’s survival. Look for the occasional wild orange tree in February to March, but while thirst quenching, its sour taste discourages more than a few bites. After a third of a mile you reach a spot known as ‘Guzmania’ named for the genus of bromeliad which clusters in profusion in a clearing to the right of the trail. Many other varieties are present there including Fuch’s bromeliad, the only Guzmania native to the United States. It is a peaceful and charming spot to stop and enjoy the tropical scenery. The trail continues, getting narrower until it ends after a half mile where encroaching vegetation blocks further travel and it is also underwater in summer. It is partially hand cleared in February when the park suddenly expands its human presence February 22 to welcome more than 500 runners and helpers competing in the tough and challenging annual Ultra 50 mile/50 Kilometer Marathon, when it is possible to hike but not bike a further 10 miles to the northern end of the Park close to I-75. Within 3 months Nature will reclaim this portion of the trail and by May it is again sealed off from human activity. However, at this point – 2.6 miles from the gate – you will probably turn and make your way back, completing a round trip of just over five miles. If hiking, allow yourself about 5 hours including stops and carry at least 2 quarts of water per person. Tony Marx is a Florida Master Naturalist and a Board Member of Friends of Fakahatchee.